I love these candy cups. They are lined and great for cupcakes. This is such a fast and easy dessert....so cute for the 4th! Prepare cake mix, as directed on package. Fill cupcake liners with prepared batter 1/2 full. Bake 350 degrees for 12-17 minutes, or until toothpick inserted comes out clean. Let cupcakes cool for 15 minutes. Meanwhile, in small bowl combine Jello and boiling water. Mix until combined. Add cold water and stir. Poke cupcakes with fork or the end of straw. Pour a couple tablespoons of blueberry mixture over cupcakes. Chill cupcakes for 3 hours. Frost with Cool Whip and add sprinkles. 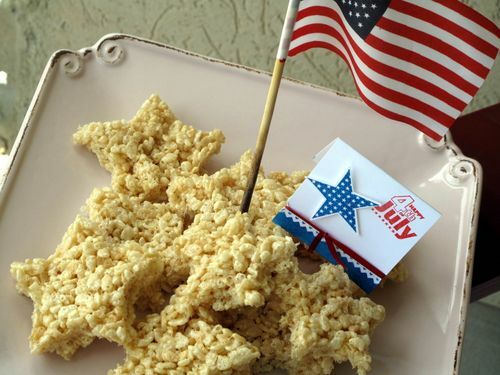 I pulled together a few of our Favorite 4th of July Foods and Desserts.